A nice and nonstandard contents! Especially interesting are the Annihilation`s captures of the pawns c2/ g2. Perhaps it would be interesting to try an another version – with white Kb3 – without keeping of the field d2!? Yet I believe that this question can be an interesting theme for a discussions and future experiments! – block of neutral chameleon (in Rook phase on a7) in the second solution – so, double mate here is needed only because of bS, not because of a neutral piece. The nature of 2 solutions becomes a little different, and also Chameleon in the 2nd solution is needs to be neutral only because of cooks in this case! This is what bothers me a lot and in my eyes means less than the absence of the model mates. Or maybe some other versions with model mates and without the weaknesses I have here are possible? I was thinking about bPb7 and bPd6 – each of them is needed in one solution only to close the line of the white King from neutral Chameleon. Maybe some more half-move to b7/d6 is possible without this block in the initial position. But I don’t see it for now as well..
I’d appreciate some other ideas! Thanks! Very nice problem showing formation of different batteries on the same line. Of course I like the original. The version is not preferable (in my view) not because of the additional piece, but because of the other points you mentioned. But I think that the model/not model mate is not the only strategical weakness here. 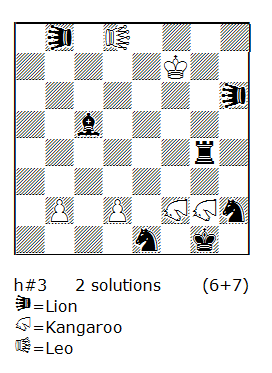 There is a little unbalanced play agains both solutions because in the first white move in a) the neutral chameleon become hurdle for the black Lion and make its movement possible. Unfortunatelly in part b) there is not the same and the black PAO have its movement from beginning. Here we have half move more, but I think that this extension is good and makes the problem more difficult to solve. In both solutions the blocks a) 1.Gg2? 2.Ge2 3.Gxc2 and b) 1.PAe5? 2.PAf2 3.PAxc2 are false because the lines for the neutral Chameleon are closed! 1.PAe5? 2.PAf2 3.PAxc2 wouldn’t work even without wPb2 because the grasshopper is captured. Yes, of course! These “tries” is possible to eliminate from the solution. Using some “fairy economy/fairy justification” thoughts, I have reached the following position, based on Julia’s idea. I don’t see the matching details of the strategy and model mates as very original and therefore not so interesting and important. First thing which I would try to make pure is the motivation for double-check in the end. As Julia mentioned in her comment, black would be able simply to move the ncR away from the first rank to parry that check, if the second check by wG is not present. 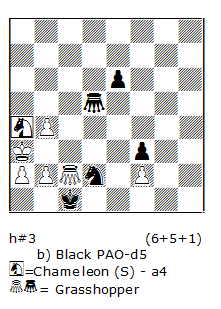 But without double-check in the original problem, black would be able to play 4.e1~! and 4.axb1~!. So, the neutral character of cS as a fairy element is not thematic, it is technical, only preventing the cooks. A merely technical fairy element is a more or less serious weakness. Square d4 could be easily guarded by wG or blocked. The only reason and motivation for creating a double check is the potential withdrawal of ncR form the 3rd rank by Black. In the meantime, Georgy has posted a version without a technical neutral piece. The same strategy with matching hurdle-effects on b6/g5 and the motivation for double-check is pure, a potential removal of bBd1 by Black. Meredith-aristocrat! But same as in the initial Evseev`s version, here is an essential thematic defect – in the second solution we have a double Annihilation effect after the move 2.Lixd2 – with line opening of diagonal c1-h6 and inclusion of KAb2 on “h2”. There is no such effect in the first solution after the capture of KAb2. Therefore the function of the figures KAb2 and KAd2 looks quite controversial, despite their control over the square h2. 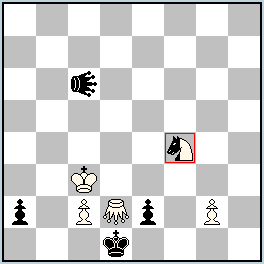 Here the activity of white and black pieces is better as in the previous versions. First, thank you very much, I consider you first version as a final shape of this scheme. I suspected that it may be possible to remove pawn f3, but still expected that some additional black force will be needed to avoid mate along diagonal a8-h1. I do not consider annihilation effect along the second rank as potentially thematic. The square h2 will be guarded anyway even if the Kangaroo is not captured, so this secondary effect is not significant. 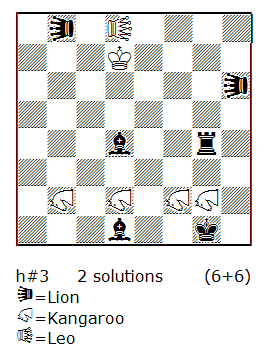 But the fact that remaining Kangaroo guards h2 is significant, because black capture a piece instead of a pawn and the remaining piece is used in second phase. It is better for me than to have unused pawns. Also, it was, of course, initially planned to use white Queen instead of Leo and Grasshoppers instead of Kangaroos. Unfortunately, in this case white force seems too strong for a threemover. I have a correct h#2.5 problem with twins using a Queen and a single Grasshopper, but a Zilahi-like effect present in a threemover is, of course, lost.